An article at Mobile Marketing Magazine mentions a UK-based company called Formation, who are currently deploying a survey on their web-to-mobile publishing site, immedia24. I am exploring Saxony (Germany) this week, and may not be able to post again until next Monday. However, as I am staying in Freiberg at the moment, I got a chance to visit a local museum dedicated to the work of Gottfried Silbermann (1683-1753), a renowned maker of pipe organs. On another topic, Paul Lamere points out some shady manipulation of track play counts on itunes. Many social music recommendation sites link into iTunes data, but it appears that such data are easily modified. One last.fm user’s play history totalled over 30 years of 24/7 listening, which seems highly…unlikely. Lamere provides a link to Doug’s Applescripts – a small script was written there which automatically sets the play count to 250,000. While this is great for artist promotion, it does reduce the usefulness of certain metrics and recommendation structures for the general user. As predicted, the Maker Faire proved to be a showcase for some wild and weird musical experimentation. Peter Kirn over at CDM ponders the significance of the bicycle meme in music – the power of the bicycle was exposed in literature by Flann O’Brien’s Third Policeman, but is there a growing bikelihood of music developing around us? The Reel to Wheel Project provides some evidence of this. 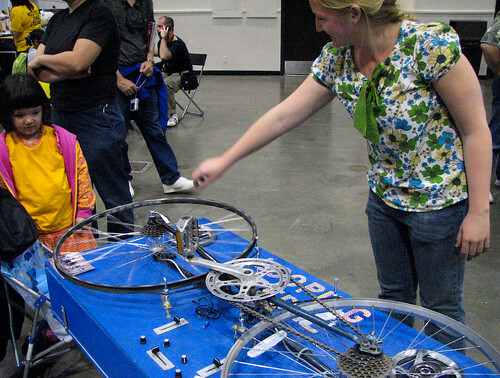 The device (shown below) uses a reworked bicycle to create a grossly mutated reel-to-reel tape machine, and by rotating the wheels a scrubbing effect can be achieved. Music and bicycles do seem to be strangely compatible – CDM’s most-viewed article ever was about an arrangement of The Sugar Plum Fairy performed solely on bike parts. On the Dublin music circuit, The Jimmy Cake’s live sets often featured the playing of a set of bicycle handlebars. CDM also has another article which covers bike ensembles and the delightful bikelophone (below). There is a huge volume of information to absorb before one could claim to be reasonably competent at the art of producing or performing music. For those approaching from the performance side, J. Pisano provides some links recommended by his students as being particularly useful. The list includes specialised sites focused on such topics as choral, drumming, audio search and sheet music. The reality virtual is encroaching upon our physical world once more – this time round, it’s sponsored by Ninja Tune. The label has organised a ‘user-generated’ club night at The Big Chill House on Pentonville Road (London), where Last.fm listener playlists will be used to determine the songs played on the night. Slightly closer to rocket science, Rocketsurgeon features an interesting compilation of Music 2.0 logos, reflecting the branding preferences of the modern OMD entity. A predominance of red and blue wet floor effects are observed here – and plenty of rounded fonts. I would be interested to know how important the colour scheme and logo design are to the success of such a site – it is generally acknowledged that green acts as an appetite suppressant, but does this apply to the food of love? It has been reported that the director James Cameron earned his first big break by getting worms to act (he ran an electric current through them). A producer who observed this feat decided that if Cameron could do that for worms, he might be able to achieve the same thing for his budget actors. Worms are now back in the limelight, with an article on New Scientist demonstrating the musical abilities of a carefully positioned soil-muncher. In this performance, the wriggling worm’s body acts as a circuit breaker, creating and removing electrical paths between various components of the circuitboard on which it has been placed. The circuits are part of an electronic synth instrument, and the end result is that the movements of the worm create a variety of different sounds and, well, noises. Derek Sivers (of CD Baby) sent me an article today which documents the phenomenal success of certain CD Baby artists – achieved purely on the back of viral exposure on sites such as MySpace. On one level, this might seem to corroborate the findings of Duncan Watts’ study, covered in a previous post on this blog. However, I think it primarily illustrates the importance of having a promotional angle – something that can be described succinctly, sets you apart and which hooks people in to what you are doing. In the case of Jonathan Coulton, he set himself a challenge of writing and recording a new song every week, which he then posted on his blog. Halfway through last year, his fanbase had grown to include more than 3,000 visitors a day and he was making a decent living off his own music sales. He interacts directly with his fans, to such and extent that he spends several hours every day responding to emails, and instead of going on tour, he picks out towns where he knows he has enough fans to fill a local venue, and goes to them to play. As another example, a low-quality video of the band OK Go dancing on treadmills generated 15 million views on YouTube – a phenomenal reach for any marketing campaign. It seems that the potential of online social marketing knows no bounds, and is only increasing in power – but are we any closer to knowing how to predict the hits? There are many websites out there that allow new bands to post bios and mp3s – so many, in fact, that it may be hard to find the good ones. Although Podcomplex is itself such a site, it never hurts to put your music out on as many platforms as possible – for a new band, maximising your exposure should be a priority. Soundclick – Upload songs and sell as digital downloads. Acid Planet – Focus on Acid and SoundForge users. Artistopia – Useful artist development resource. Canopy Channel – New multimedia library. Artist Server – Create a bio and upload songs. Funender – Upload songs, electronic slant. Mp3lizard – Neat Finnish site. Download.com – Now a Cnet property. #1band – Band online community. Primetones – Take the ringtone angle. Radioindy – Partners with Rhapsody, internet radio. Amie Street – Sell CDs and gain exposure. Unsignedbandweb – Features web radio by genre. Beta Records – Flashy music database. Channel Byron – New Zealand OMS site. Soundlift – German OMS site. Last.fm – Huge social music site. This is by no means an exhaustive list – there are thousands more sites offering similar services on the Internet. For a table of OMD sites, you can refer to this page at Armydiller. It hasn’t been updated in a while, but many of the resources are still valid. If you don’t have time to search for sites that accept submissions, you can use a promotional service such as Music Submit, but you’ll probably just have to register these results yourself anyway.